The first episode of what I expect to be this season’s biggest fluffy, sweet, and adorable series is here, and it is almost exactly what I’d hoped for. I knew I would be watching this series as soon as I saw it on the list for this season. 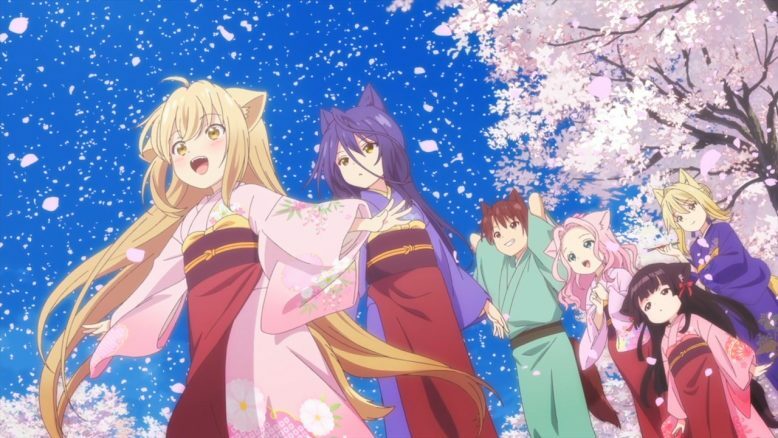 Konohana Kitan actually began its existence as the manga Konohanatei Kitan back in 2009, but only released 8 chapters before going on hiatus for several years. Then, in 2014, the new version of it started up in a different magazine, and it has been ongoing ever since. 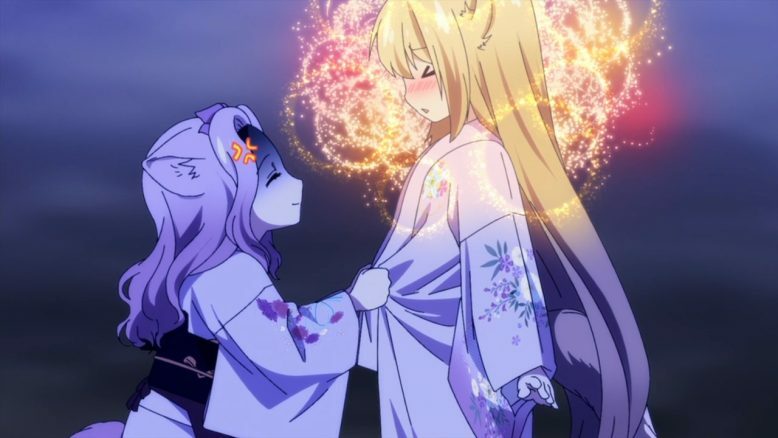 I’ve read the entirety of Konohanatei Kitan, but Konohana Kitan has only had a single prologue chapter translated, leaving me almost entirely in the dark about it. Now that it’s become an anime I will finally get the chance to learn more about what I’ve been missing! 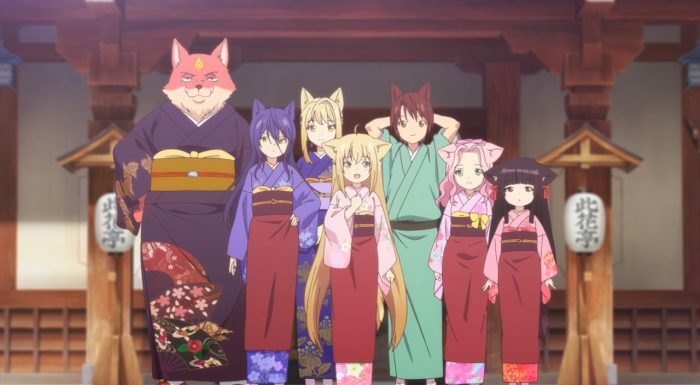 Konohana Kitan is set in and around the eponymous Konohanatei hot springs inn, which resides in a strange town filled with supernatural beings of various sorts, along with what appears to be the occasional Human. 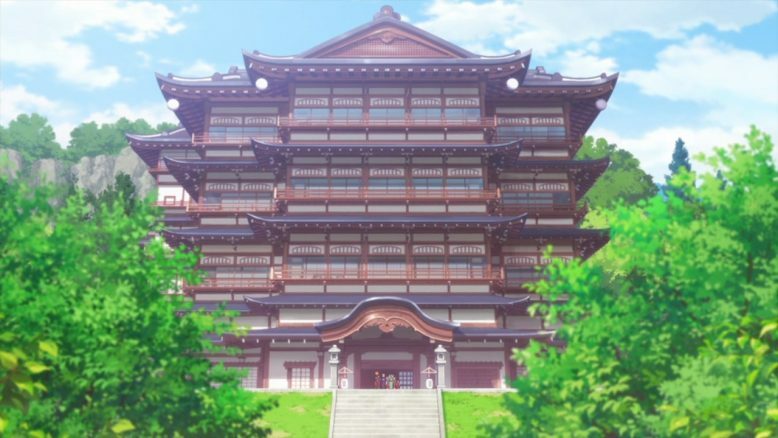 Konohanatei is an amazing-looking place: four stories built in classical Japanese style, there’s an amazing elegant beauty there. Polished wood floors and balconies an every level, paper lanterns, beautiful natural stone settings in the baths surrounded by trees and other signs of nature… There is a beauty in the pure aesthetic of the place, unmarred by any traces of the modern world. The fact that all its staff (except the owner) are attractive young foxgirls only adds to the mystical appeal: the feeling that such a place, maintained so beautifully and run so well could never truly exist in our world. 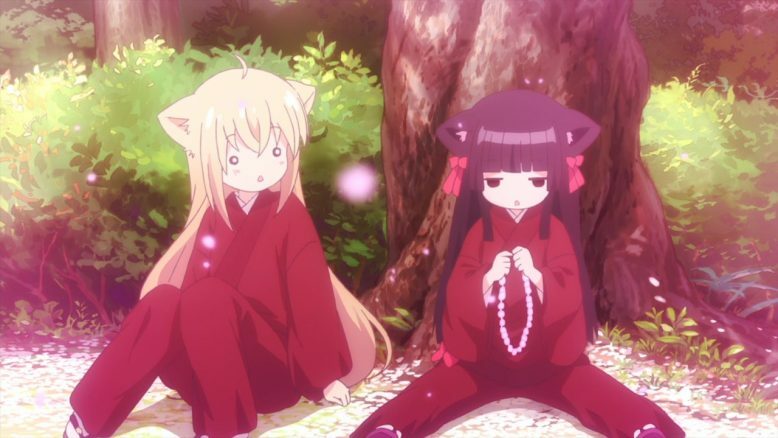 Our main character is Yuzu, a young foxgirl who apparently has had a very sheltered upbringing. Her introduction to the staff and customers of Konohanatei is a bit rough, but fortunately she buckles down, determined to do her best. Despite enmity from her assigned mentor Satsuki (who fairly clearly has other plans for herself besides working at the inn for the rest of her life), Yuzu remains upbeat and enthusiastic. Perhaps she is not the perfect representative of the quiet graceful attitude an attendant at such an inn is expected to have, but as the customer from this episode shows, Yuzu can appeal to people in her own way. Her willingness to go along with his silliness about knocking down a star to make candy shows that she still understands the principal of her work. We get quick introductions to the rest of the cast. Kiri is the head attendant, and she clearly knows her job well. She has a good grasp of everyone’s personalities and how to assign them in order to get the best results. 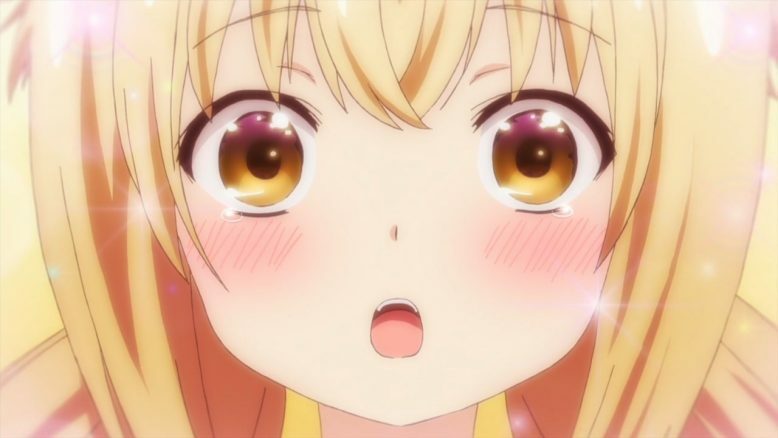 Also she is capable of acting gentle and refined as needed, but also confidently grab Yuzu by the collar and pull her rapidly through introductions with the other girls. She seems like a capable leader, and it’ll be interesting to see more of her. Natsume is a short-haired tomboyish-seeming girl, who seems to do mostly physical work behind the scenes: or at least every time we’ve seen her so far she’s been wearing the plainer clothes that seem to designate workers who aren’t directly interacting with customers. Ren is a pink-haired beauty with a good sense for clothes and a bright smile, but who hides a sharper tongue underneath it all. Satsuki, as mentioned above, is serious and diligent, which puts her at odds with Yuzu’s inexperience. She seems rather a bit too serious for her own good: given that she mentions to Kiri that she doesn’t intend to stay there, she may be trying to prove something through her diligent work. If so, I suspect it’s going to backfire if she doesn’t stop to take a breath and regain some balance. Lastly is the youngest employee of Konohanatei: Sakura. Kiri claims she “forgot” to introduce Yuzu to Sakura at first, which I find hard to believe. Kiri doesn’t strike me as the sort to forget things like that. Sakura is a young foxgirl, although exactly how young can be hard to guess with anime characters. I would say she’s probably not younger than five, and probably not older than ten. A quiet girl who only seems to speak when she feels she has something genuinely important to say, Sakura could be considered almost the antithesis of Satsuki, taking a very laid-back approach to work. Not lazy, because it appears that she still gets her work done, but I believe she represents the attitude that one can still take time to relax and see the beauty in life even while accomplishing what one needs to accomplish. I’m certain that’s why Kiri reassigns Yuzu to work with Sakura for the second part of the episode; giving Yuzu a different perspective than just Satsuki’s. I’m looking forward to whatever we’ll learn about everyone going forward from here. Series like this will often take the opportunity to look into each character and some issues that they have, and perhaps help them make some steps towards resolving it, possibly with the new addition to the group acting as the catalyst. I feel like there stands to be a lot of enjoyable times with these girls. I would be remiss if I don’t take at least a few moments to mention the art in this series. While not necessarily the most outstanding I have ever seen, the creators definitely know the value of giving us some beautiful scenery. 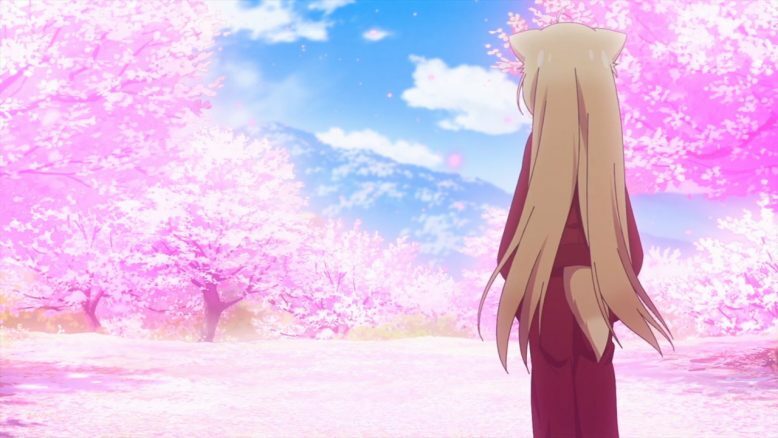 There are some truly gorgeous shots of blooming sakura trees in a couple of scenes, and the view from the upper balcony of Konohanatei is something worth seeing as well. Also the various girls are lively and expressive: particularly Yuzu who wears her heart on her sleeve, so to speak. A good job all around. All told this was an excellent first episode. Nice to look at, calming, characters that are enjoyable and interesting, and some decent potential for the future. 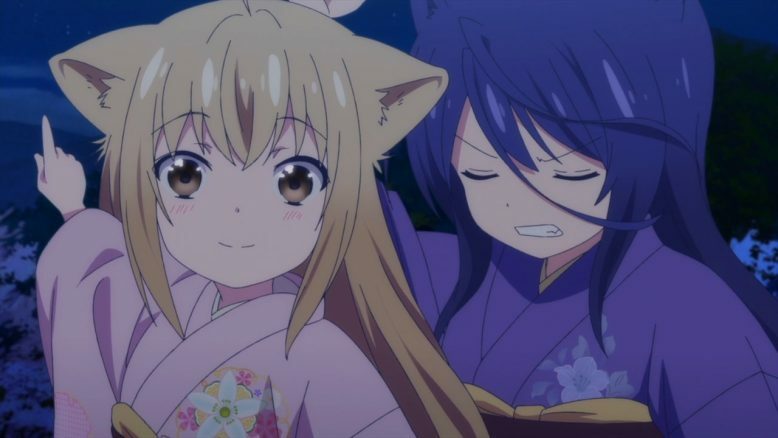 If you’re up for a slice of life show with adorable foxgirls in some lively traditional Japanese scenery with a trace of the supernatural, this series may be just what you’re looking for. That said, just for safety’s sake, while it’s pretty likely I’m going to end up covering this series for the season, I’m not going to actually commit to that just yet. I’ll get back to you all on that once I feel like I’ve gotten a more complete perspective of the season. I am definitely going to be watching it, though, and I urge you all to do the same. Also, remember this is set in a hot springs inn. 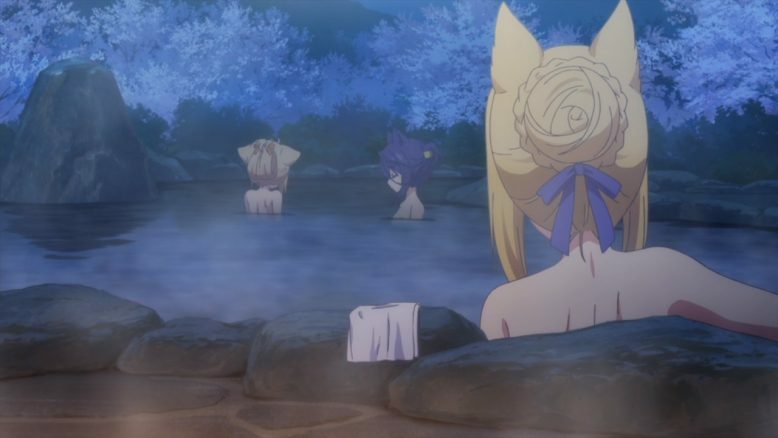 Expect to see lots of scenes of the girls taking baths.